Relieve back pain in comfort and style! Rotate and relax to temporarily decompress your spine and enhance flexibility with the FDA-registered Teeter FitSpine X3 Inversion Table. Teeter elevates its innovative track design with an updated ergonomic shape and 8-point floating suspension system that flexes with you for greater range of motion. You'll love the extra-long, smooth ratcheting Ankle Lock Handle and wrap-around cups that make securing your ankles easy and comfortable. Added features include EZ-Stretch Traction Handles and extra-long Stretch Max Handles for more stretching options and assistance. Tension tends to concentrate along the acupressure points along the meridian of the body. Inversion is a great way to deal with this tension. Inversion assists in battling the aging process by temporarily elongating your spine. 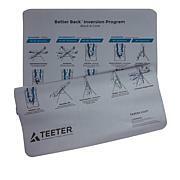 Teeter inversion tables received superior ratings by Dynamark Engineering for equipment and ease of assembly. 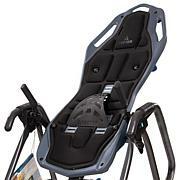 Teeter inversion tables are listed to UL 1647 specifications. Compared with competing brands, engineering tests have shown that Teeter inversion tables are the most precisely balanced. Teeter decompression devices are multiple user, reusable devices for home use, intended to provide traction to the spine while stretching the para-spinal muscles and soft tissues. 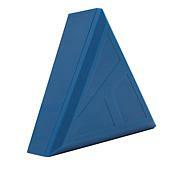 The devices provide non-powered traction and are meant for use by adults. Teeter decompression devices are indicated for temporary relief of back pain, muscle tension, degenerative disc disease, spinal degenerative joint disease, spinal stenosis, herniated disc, spinal curvature due to tight muscles, sciatica, muscle spasm and facet syndrome. Do not use equipment if you have any medical condition including but not limited to one that may be made more severe by blood pressure elevation, intracranial pressure or the mechanical stress of the inverted position. Do not use if you are uncomfortable during regular inversion, when sores or skin lesions are present or on sensitive skin, on varicose veins, or if you have muscle, ligament, tendon or other soft tissue issues. Caution: Please consult your physician for approval before use and carefully review list of medical contraindications for inversion. Always wear securely tied, lace-up shoes with a flat sole when inverting. Nodes are only intended for use against muscles. Do not position nodes so they can place pressure on bones. Do not use if you are over 6' 6" tall or over 300 lbs. It is so amazing to own a Teeter inversion table.....because it works! Just when I thought surgery was my only option....I tried it after years of being "on the fence". My back and abdominal muscles are literally relaxing...back & hip pain IS improving...plus, I dont have to take as many NSAIDS as I used to. I'm a Teeter Believer!Thank you, Mr. Teeter and HSN for helping me. Please just try it! You have nothing to lose. I, like many, have suffered from chronic pain for years. I sit at a desk all day, have done so for years, and my neck and shoulder pain is often times unbearable. I have tried everything to relieve the pain and nothing has worked. This Teeter Inversion table is amazing! I can feel a difference within minutes. I was a bit intimidated at first about being upside down but you can control how far you invert. HUGE difference in my pain and my life!! 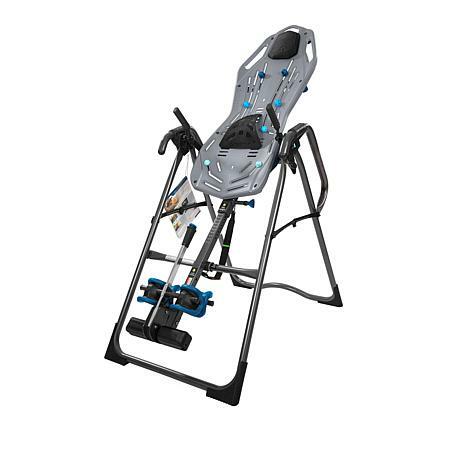 I had seen the demo of the Teeter Inversion table before and just ignored it. My neighbor has an older version and I tried it and only ended up with a dizzy spell and headache..Well fast forward to the latest version the FitSpine X3...I have suffered with back pain for many years. Bought it, and am hooked.. my husband and I both have noticed the relief to our backs immediately..LOVE IT, no dizzy spells or headaches. Worth the money..
My husband has arthritis in his back. Asked his doctor if this would be helpful. Was thrilled to get it on easy pay, so there wasn't a lot of money out of pocket id it didn't relieve his back aches. I'm very happy to say it works great! I would recommend this product.